The latest Bloomberg Eurozone Retail Purchasing Managers' Index, based on a mid-month survey of economic conditions in the euro area retail sector, rose from 44.0 in June to 46.0 in July. By remaining below the 50.0 level, the index pointed to a further fall in sales during the month despite an easing in the rate of decline from the steep pace seen in June. Italian retail sales declined in July for the 17th month in a row as higher energy and food prices hampered consumer spending. The seasonally adjusted PMI for retail sales was at 38.2, compared with 36.3 in June. 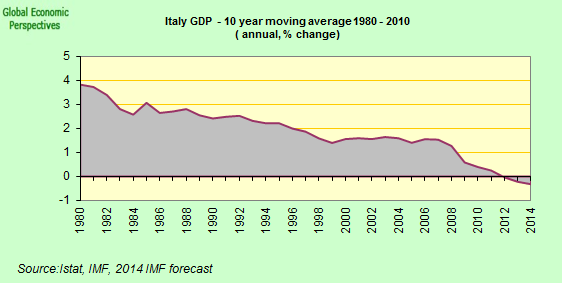 I don't know what conclusions everyone else wants to draw from this, but to me it sure looks as if we might see the second consecutive quarter of contraction in the Italian economy in Q3, in which case Italy is already in recession. Of the five product categories covered by the survey, food & drink retailers reported a year-on-year increase in sales revenues in July. However, gains in annual sales in part reflected higher prices rather than improvements in volumes. For the third successive month, the steepest decline was reported for autos & fuel, as deteriorating consumer confidence hit car sales. Annual sales of pharmaceuticals were marginally lower following two months of growth. The rate of increase in prices paid for goods by retailers remained elevated in July, picking up on June to register the fourth-highest pace yet recorded by the survey. The prices index edged up to 67.3, from 67.1. Purchase price inflation hit record highs in both Germany and Italy, but eased to a ten-month low in France. Retail sector employment fell for the fourth month running in July, with the rate of job losses unchanged on June's twenty-eight month record. The employment index held steady at 48.6. All three countries registered shrinking retail workforces, with French retailers reporting the steepest rate of decline (and posting the largest monthly fall since January 2006). 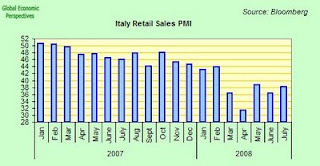 In Italy, headcounts at retailers fell for the seventh consecutive month. Retail staffing levels were also trimmed in Germany, but very slightly.